Milwaukee PTV was so pleased with its four months of eagle-nest verite, carried continuously on one of its new DTV multicast channels, that it’s hoping to shoot the birds in high-definition and surround sound next spring. In the meantime, the station is checking out various displays at the Milwaukee Zoo for possible HD broadcasts starting this fall, says David Felland, engineering director. The live feed from an eagle nest in northern Wisconsin occupied Milwaukee PTV’s digital Channel 10-5 starting in April, when the adult birds were sitting on their two eggs; through May, when the weaker chick died; until the end of July, when the other eaglet took its first flight. For most Milwaukee viewers the slowly advancing drama could be found on one of the station’s digital channels on Time Warner Cable. Stars of Milwaukee PTV’s reality feed from northern Wisconsin. 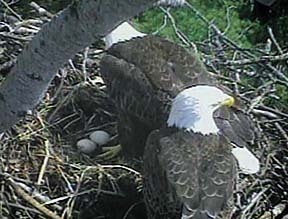 “It blew everyone away, the amount of interest it attracted,” Felland says of the live nest cam. The station got 230 calls and e-mails about the eagles, says publicist Kay Tierney. The only comparable public response in recent months involved the departure of Louis Rukeyser, she says, and those calls were not nearly so positive. The feed was provided by a Michigan-based educational materials publisher that is only coincidentally named American Eagle Co. Inc., according to project director Keith Albritton. The company, anticipating strong interest from classrooms, tried unsuccessfully for distribution by major cable operators but Milwaukee PTV ended up providing much of the audience, he says. Albritton located a reliably prolific eagle pair whose nests were convenient to a broadband telephone connection near Minocqua, Wis., and then installed freeze-proof video cameras above the eagles’ alternate nest as well as their primary nest. She particularly enjoyed those circle-of-life times when the cable channel combined a live picture-in-a-picture of shad climbing a fish ladder with the larger picture of eagles feeding fish to their eaglets. The Massachusetts nest cam was inspired, in turn, by a closed-circuit feed from a nest at the Iroquois National Wildlife Refuge in western New York, Boardman said. Anyhow, it will be a while before Milwaukee PTV can put real-time animal life on the screen again, so in the meantime it’s using the same digital channel for live feeds of Midwestern weather radar, Felland says. The sequence of radar maps starts with the area of Grand Forks, N.D., and moves eastward along the path of so much unwelcome weather.